One day the Pandava brothers went far from their dwelling place in search of deer in the jungle. They saw a deer and followed it but the deer vanished. They felt very tried and thirsty. Yudhishthira could not walk any further. They also could not find any sign of water around them. So Yudhishthira sent Sahadeva to search water. Sahadeva went from there but he did not come back. Yudhisthira became worried and he sent Nakula, Bhim and Arjun one by one. When they did not return, Yudhishthira went himself following their foot steps to know what had happened to them. After some time he came to a clearing. He saw a beautiful pool. The water of the pool looked fresh, cool and inviting. But at the same time, he saw another terrible scene. His all brothers were lying on the bank of the pool. Their eyes were closed. Yudhisthira became mournful. He prayed the god to take him also because he could not live without his dear brother. He cried bitterly. However, he could not control his thirst. When he bent down to drink the water, the sound of the Yaksha ordered him that he could not drink the water until he answered his question. He had given the same order to the other Pandava brothers but they ignored it and he had cursed them. However , Yudhisthira was very wise and patient. He requested the Yaksha to ask his question and promised that he would answer them as well as he could. The Yaksha asked him many questions that he answered sincerely and rightly. The Yaksha was very much impressed by his replies and he promised to revive one of his brother. Yudhisthira was very just, fair, truth and wise. So, he requested the Yaksha to save Nakula, the son of his step mother. 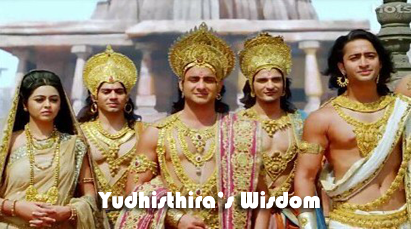 The Yaksha was even more impressed by Yudhishthera's wisdom, justice and fairness. So he decided to save all Yudhisthira's brothers.He appeared before Yudhishthira as Yama, Yudishthira's hevenly father, the god of justice and death. He revived all the brother of Yadhisthira. He also advised them to remember him in future difficulties. Then he suggested them to go to Matsya with Draupadi and spend the rest exile period there. ⇒ Translation In Nepali Of "Yudhisthira's Wisdom" is provided in Comment Box below. Happy Days! Once in the exiled period five Pandav brothers grew thirty while running after a deer in the forest of Yaksha. In the hot weather they were tired and thirsty Yudisthira sent his youngest brother Sahadeva in search of water. He came across a beautiful pond and ready to drink water hurriedly. Some voice stopped him from drinking until he could have given his questions’ answers. Thinking it might be fancy he drank water. He sooner got fainted. Similarly, Nakula, Bhima and Arjuna got the same fate lastly Yudhisthira himself went and found such condition of brothers. He waited admonition form drinking water after listening similar. He gave the answers of all questions asked by Yaksha until Yaksha became pleased. He promised to restore one of the brothers. For that Yudhisthira preferred Nakala with much pleasing reason. So Yaksha being happy restore all his brothers and gave blessing for easy and comfortable life of remaining exiled period. This mythological story is taken from Mahabharata. The righteousness of Yudhisthira is the central point of this story. It focuses on wisdom; patience and loyalty to God are great human qualities. If we conduct any work rightly that has creative result. The story seems to tall that we must be faithful and honest on our work. If we have selfish and careless attitude, that ruins our personality in particular and humanity in general. Again, the reasonable and philosophical answers of the questions given by Yudhisthira can be knowledgeable. The due respect and love to the brother becomes another important meaning of this story. The charming table of Mahabharata seems to be philosophical and knowledge to any reader. Despite of its morality and simplicity of language there are some contradictory points in this story. At present, there is a question over the existence of God. Some disagreeing points can be given asking question like:(a) can we see Yaksha in our life? (b)can sun shine with God’s power? (c) Do god exist really? (d) Is it true having less anger means being happy? Etc. Still we can learn many more philosophy from this story. Reading this text gave me new awareness. To be true human, we must have wisdom and righteousness. We learn that we should forsake pride, anger, desires,etc.to be happy and satisfied in our life. I have learnt to change myself changing my thinking as well. 4 Responses to "Yudhisthiras Wisdom | Summary | Four Levels | BA | BBS"
उक्त दृश्य देखेर युधिष्ठिर तलाऊ किनारमा बसी धेरै बेरसम्म रोए। त्यस पश्चात धेरै तिर्खाएकोले तलाऊ किनारसम्म घिस्रिदै पुगे। उनी पानी पिउन भनी निहुरेका मात्र के थिए यक्षको चेतावनी आयो। चेतावनी सुनेपछि युधिष्ठिरले भने "तपाई प्रश्न सोध्नुहोस्, मैले सकेजति उत्तर दिनेछु। "